A 58-year-old anti-fracking protester has appeared at court charged with assaulting a security guard by pulling part of his beard out. Barbara Jayne Fish of Powell Avenue, Blackpool denied assaulting Neil Hartley who works at the Cuadrilla gas exploration site on Preston New Road, Little Plumpton, near Preston on September 26. District Judge Jane Goodwin sitting at Blackpool Magistrates Court heard that Fish would be using self-defence as her defence. Her trial will take place over three days starting on January 28 next year. A second protester also appeared before the District Judge. He is Stuart Acroyd, of Maple Farm, Preston New Road. The 42-year-old is charged with wilfully resisting a police officer in the execution of his duty near the Cuadrilla site on September 26. Acroyd denied the offence and his trial will take place on January 29 next year at Preston Magistrates Court. 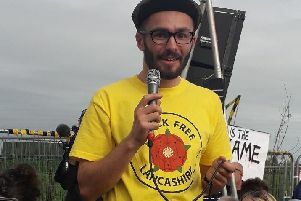 Proceedings began days after fracking finally started in Lancashire after years of protests and legal wrangles. and make climate change worse. 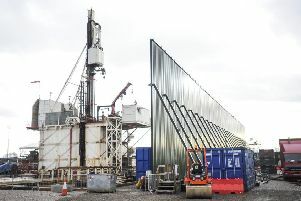 But shale gas supporters, who say it will bring a valuable home grown resource and jobs and prosperity, have hailed the move. The decision by police to close Preston New Road as a national protest group staged two lock-on demonstrations was criticised as it caused long delays during the morning rush hour. Lancashire Police shut the whole of the road from Whitehill Road to Westby Road for “safety reasons” from before 8am to 1.45pm. But campaigners said a contraflow system should have been put in place in the first instance to keep traffic flowing. A 34-year-old woman and a 45-year-old man, both of no fixed address, were arrested on suspicion of wilful obstruction of the highway.